The Cersaie which is accepted as one of the most important ceramic tile and bathroom furnishing trade fair in the world will start at 23th of September till 27th of September 2013 and take place in the city of Bologna, Italy. Everybody admit that this is the key event for ceramic and bathroom furnishing fair. The global international ceramic tile expo celebrated its 30th anniversary last year and attendance was more than 100.000 people, including 32% international visitors. There were 900 companies from 33 countries and the fairgrounds were full of capacity which shows the importance of this fair for ceramic sector. As turkishceramics Promotion Group, we will attend Cersaie for the 7th time. Every year turkishceramics present a music festival with masters of music to the fair’s attendee. 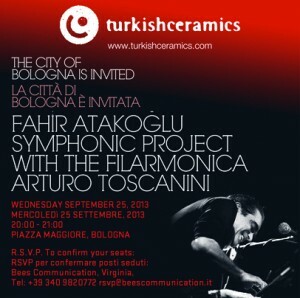 This year beside attending to the fair, turkishceramics also will present a great symphonic project by Turkish composer and pianist Fahir Atakoğlu with the Italy’s leading symphony orchestra the Filarmonica Arturo Toscanini. The show will be on at Wednesday September 25, 2013 on the center of the city Piazza Maggiore. Ceramic sector professionals following this fair every year and this fair shows the new year’s trends and innovations. With its increasing participation to Cersaie every year Turkish ceramics companies proved one more time that they became global brands. This year there will be 22 leading Turkish ceramic brands which will introduce the Turkish ceramics to the world and show their latest technologies and collections. group and target countries. To see the latest technologies and more about ceramic industry, “turkishceramics” are waiting for you in Cersaie. This entry was posted in Home and tagged ceramic tile, ceramic trends, ceramics, cersaie, turkishceramics on 2013/09/18 by admin. Making its UK debut at 100% Design 2013, Turkishceramics is collaborating with London-based architect and interior designer, Ferhan Azman, founder of Azman Architects, to design a ceramic installation for the International Pavilion that will provide a bar, meeting areas, a private events space and a VIP area. Turkishceramics is the lead sponsor of the new International Pavilion at this year’s event. New to 100% Design, the International Pavilion will bring together talent from countries and cities around the world such as Turkey, Argentina, France, Korea, Shenzen, Südtirol and Taipei. Turkishceramics will be representing over 30 manufacturers and exporters including VitrA, Kale, Serel, Seranit and Ege Seramik. The Turkishceramics installation can be visited at the International Pavilion at 100% Design at Earls Court from 18-21 September. For more information on 100% Design please visitwww.100percentdesign.co.uk. For more information on Turkishceramics please visitwww.Turkishceramics.com. This entry was posted in Home and tagged 100% Design, ceramic tile, ceramics, Ege Seramik, Kale, london ceramic fair, Seranit, Serel, turkish ceramics, turkishceramics, VitrA on 2013/09/03 by admin.